Strong and full-bodied Oolong with a refreshing floral aftertaste. Aged Shui Xian have a smoother mouthfeel. 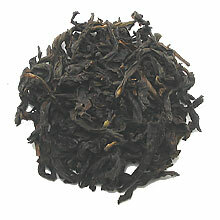 Traditional looking Oolong tea, with dark and curly tea leaves. The distinctive feature of Shui Xian tea leaves are their size, which is huge in comparison to other Oolong teas.